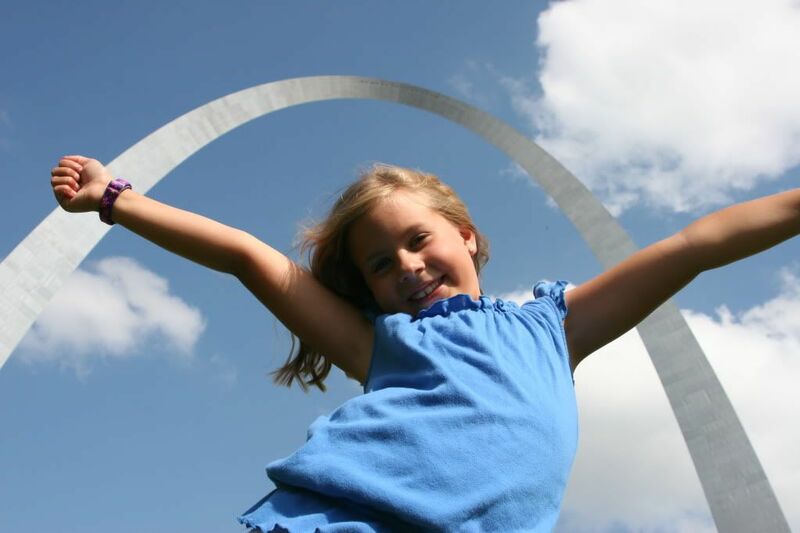 The St Louis Gateway Arch is a structure known as a catenary curve, the shape a free-hanging chain takes when held at both ends, and considered the most structurally-sound arch shape. The span of the Arch legs at ground level is 630 feet, the same as its height. We decided to have a quick weekend getaway to St Louis. It's been a very long, fun filled day, but I must admit going up in the arch was my least favorite part. We waited in a line in the heat for at least 30 minutes to get through security. Then we had to get in a long line for tickets. There was an hour and a half wait until the next tickets were available, so we opted to get them for later at 8PM and have dinner first. We had to go back through security and then wait in another line. To make a long story shorter, we were totally deceived. Part of the 8PM decision making process was based on the fact that the ticket attendant told us there would be no wait. We waited for almost an hour before we finally made it to the top. By that time it was dark outside and all of my pictures turned out blurry. I was hoping for some daylight with a nice sunset. While waiting some little girl stepped on my ankle and I snapped at her out of pain. Haldan thought I had overreacted, but I was thinking about the mile walk home with an injured ankle. When we got to the top there were so many people that it was difficult to even move, let alone get a picture. The good news was that we made it out in time to at least get the fireworks finale that was going on tonight. During dinner I talked to my children about putting things in perspective because there has been so much whining over such trivial matters lately. I told them that the next time they bugged each other or got upset about something they needed to rate it on a scale of 1 to 10 and think about the importance it had in an eternal perspective. Well, tonight on the way home Haldan tried to remind me of this very thing I had talked about. Life is hard. Things don't always work out as planned and then we get frustrated. I was excited about the prospect of getting an amazing St Louis picture at sunset from the arch. It didn't happen, I had an unexpected, extremely long wait, feeling claustropobic all the while, but... the children had fun. I guess if I rated it on a scale it wouldn't be above a 5, but it felt like a 10 at the time. So, I guess the moral of this story is that I'm a hypocrite and need to practice what I preach as hard as it may be at times. Oh, and we need to get tickets online next time. I'm taking deep breaths and going to try to lower my expectations for tomorrow. I feel like a hypocrite many moments of the day. In a twisted way, I'm glad to know others have the same feelings. I hope your ankle is feeling better. aaah Alicia!!! That's so sad!! But I do like the lesson you were trying to teach your children. Sometimes the lessons we teach our children are lessons we're still trying to master ourselves. I find myself doing that with my kids. I know how I want them to turn out (being devout scripture readers, saying the prayers, having a sound mind, good common sense, etc..) and yet, I dont know how to be anything but me which is full of flaws in almost all of those areas...probably a confusing example. But just hang in there, it's okay! :) I hope you're ankle is okay too! I bet under more pleasant circumstances you wouldn't have snapped; unfortunately and honestly, I'd have probably done something similar, after such a frustrating and dissappointing afternoon/evening. But I do like this pic of Camille!! I wish we'd have made the trip when we were closer!